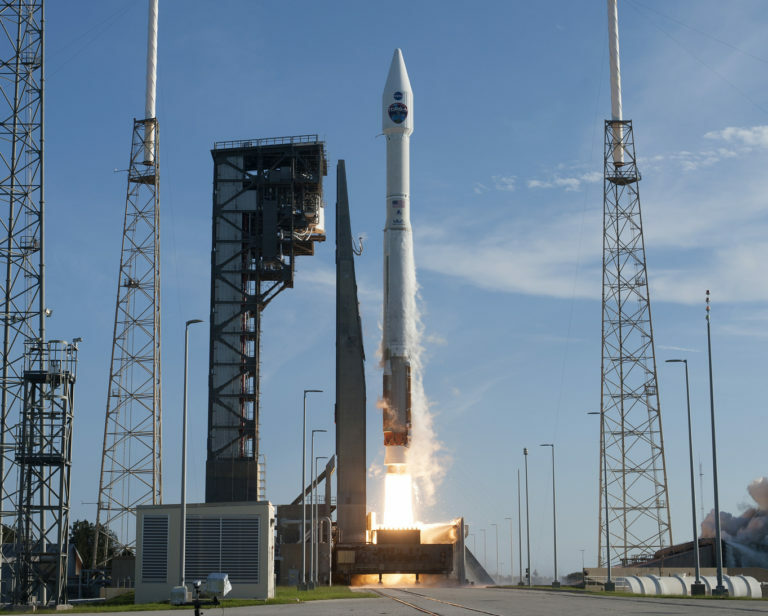 August 18, 2017 – A United Launch Alliance (ULA) Atlas V rocket carrying NASA’s Tracking Data and Relay Satellite-M (TDRS-M) lifted off from Space Launch Complex-41 August 18 at 6:29 a.m. MDT. The TDRS-M is the third and final mission in the series of third-generation space communication satellites to orbit, as part of the follow-on fleet being developed to replenish NASA’s space Network. Ground controllers report the satellite is in good health at the start of a four-month checkout in space by its manufacturer, Boeing. Following several months of calibration and testing, TDRS-M will be renamed TDRS-13, and put into service. The Tracking and Data Relay Satellite System (TDRSS) is a space-based communication system used to provide tracking, telemetry, command and high-bandwidth data return services. Microwave communications equipment and gimbaled antennae are the primary payload of each TDRS. The system is capable of providing near continuous high-bandwidth telecommunications services for the International Space Station, Hubble Space Telescope, rockets and a host of other spacecraft. All six of the newest TDRS satellites have been built by Boeing and delivered to orbit on ULA Atlas V vehicles. The mission of the TDRS project, established in 1973, is to develop, launch and deliver data communications relay spacecraft to support NASA’s Space Network, which provides high-data-rate communications and accurate navigation. The TDRS-M spacecraft is effectively identical — in both function and performance — to the TDRS-K and -L spacecraft. This satellite was launched aboard an Atlas V 401 configuration vehicle, which included a 4-meter extended payload fairing. The Atlas booster for this mission was powered by the RD AMROSS RD-180 engine, and the Centaur upper stage was powered by the Aerojet Rocketdyne RL10C engine. This is ULA’s 5th launch in 2017 and the 120th successful launch since the company was formed in December 2006.